The turkey, the stuffing, all the trimmings – after a while, it can just get to be too much. Have yourself a gleeful little Thanksgiving away from home and invite your entire crew. We have five Caribbean bites that will not only spice up your meal but also give you a true taste of island life. These bite-sized, golden-fried balls of greatness are absolute bliss on the tongue. The queen conch is a Bahamian staple for both their cuisine and tourism industry, and they’re indigenous to the waters surrounding the islands. Their pearly-pink shells are sold as souvenirs in gift shops and along the seaside right from fisherman’s boats, and the meat is used in a multitude of dishes, so it’s a must-try for anyone visiting this island nation. Don’t let the word “snail” turn you off. Conch has the texture of clams or mussels with a fresh sweetness that’s heaven from the sea. For the fritters, the conch meat is finely chopped and mixed with bell peppers, onion, cayenne, and garlic, then fried to perfection. 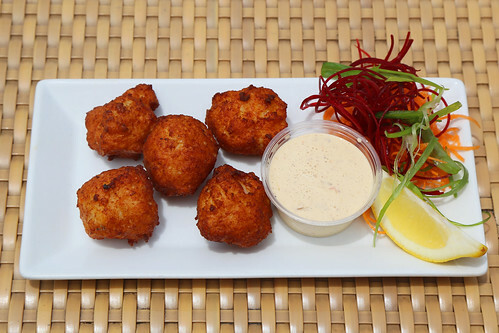 Dip the fritters in a side of spicy lime aioli – also known as Calypso Dipping Sauce – and get ready to be blown away by that bold Bahamian flavor. The islands of Hawaii are a fully-stocked pantry of tropical and international delicacies. For traditional Hawaiian fare, just head to a luau on any of Hawaii’s islands, and you’re sure to find a buffet filled with fresh pineapple, pungent poke (the Hawaiian version of raw fish ceviche), and a purple dish called poi. But the guest of honor at all luaus is Kalua Pig, and for Hawaiians, you either cook it right or not at all. The fully intact pig is slowly roasted for hours in an underground oven known as an imu. In the end, this time-consuming process is totally worth it, and the reward is pull-off-the-bone, melt-in-your-mouth pork meat with a smoky flavor that you’re sure to pig out on. But there’s no need to be embarrassed. You can bet your fellow luau guests will be lining up for multiple helpings right alongside you. You’ll notice we left the word “chicken” off the end of this dish, but there’s a method to our madness. 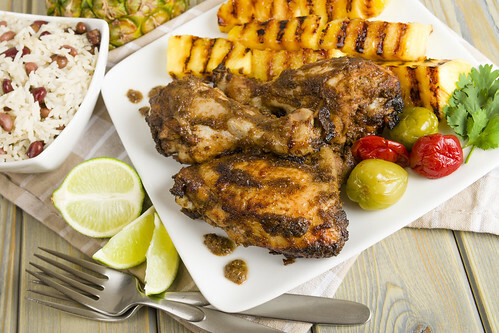 The term ‘jerk’ refers to the unique style of cooking and spice blend featuring Scotch Bonnet peppers, allspice, and nutmeg, which all grow in abundance on Jamaica. And while the fowl variety tends to be a favorite for us mainlanders, Jamaicans use this technique on pork, beef, fish, and even vegetables. You’ve probably seen or tasted a version of this spicy meal at eateries in the States, but those lucky enough to have sampled it straight from the source will tell you nothing beats the jerk dishes on the Island of All Right. What’s their secret? Jamaicans cook the jerk over coals mixed with fresh, green pieces of pimento wood from the allspice trees, giving it a flavor you just can’t replicate at home. The vivacious island of Puerto Rico is a U.S. territory, which means you won’t need a passport to indulge in all of its spectacular food, and don’t even think about leaving the island without trying this popular dish. Mofongo might sound silly – and look it, too – but it’s rich, savory flavor is no joke. It resembles a loaf of yellow-green mashed potatoes, but traditionally, it’s made from smashed fried plantains that are then mixed with garlic, broth, and, on occasion, small pieces of pork or bacon. 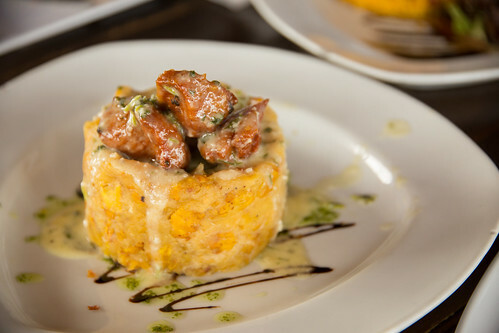 Mofongo can be served by itself, stuffed, or smothered with an array of meats ranging from chicken to crab. No matter how you prefer your mofongo, be sure to wash it down with another ingenious concoction hailing from Puerto Rico – the Piña Colada. It’s only fitting that we finish our tour of tropical flavors with something sweet, and no island does dessert better than the Dominican Republic. From Spanish-influenced treats with a tropical twist, such as coconut flan, to decadent cakes filled with native fruits like guava, this island has a dessert to satisfy every sweet tooth. 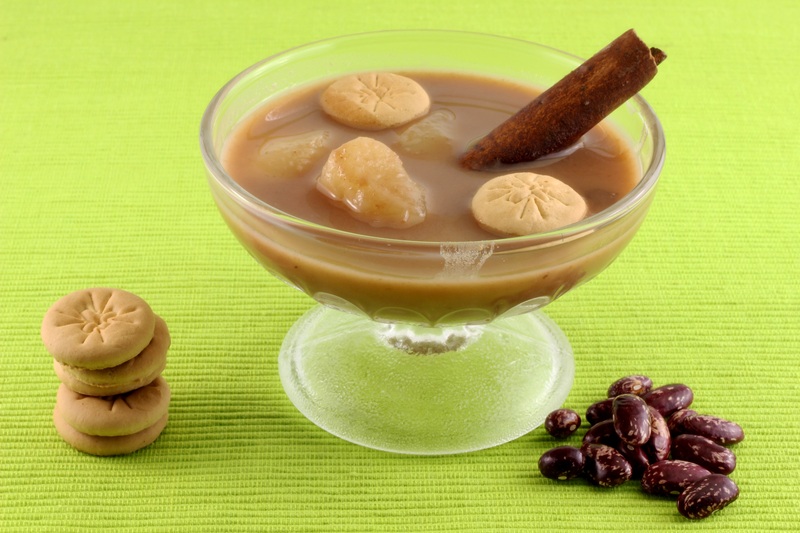 If you’re craving a sweet that has 100% Dominican roots, grab a big bowl of Habichuelas Con Dulce – or Sweet Cream of Beans. Wait, did we say beans? Yes, we did, and you’ll be pleasantly surprised to find they make an excellent dessert. Every household has their own style for this liquid treat, but all recipes cook puréed, soft-boiled kidney beans with coconut and evaporated milks, sugar, and cinnamon to create a creamy dessert. Top it with pieces of sweet potato, raisins, or milk cookies to add the perfect amount of texture. 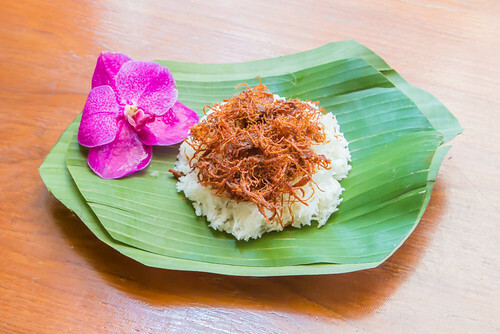 While picturesque beaches draw thousands of visitors to islands around the world, it’s the one-of-a-kind food that’ll keep you coming back for seconds. And on Thanksgiving, might as well go up for thirds. Contact your travel agent today to start planning your holiday in the tropics now.